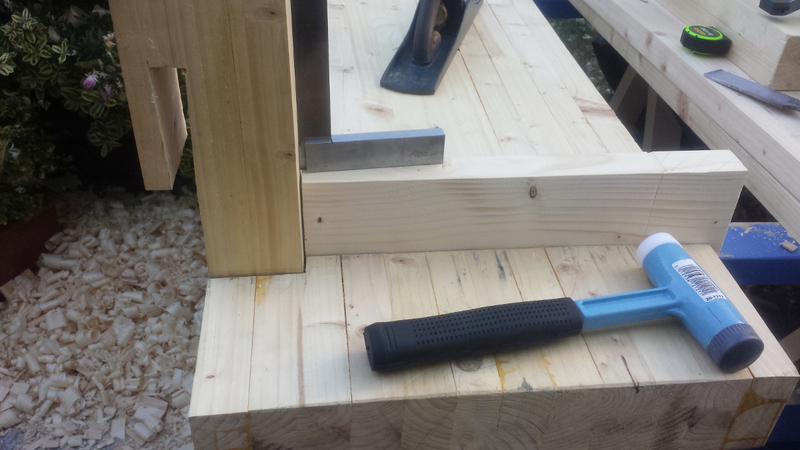 This weekend’s been that point where all those lovely square CAD sketches and notebook sketches and watching youtube videos and so on has been translated into a set of really scruffy joints in really low-class timber. I notice that this point is not covered very well in most of the youtube videos out there. Mainly because you could just write “yeah, don’t bother, save up for a mcguire bench instead” and it’d be less unpleasant! Not a full day, but a good four or five hours at least. 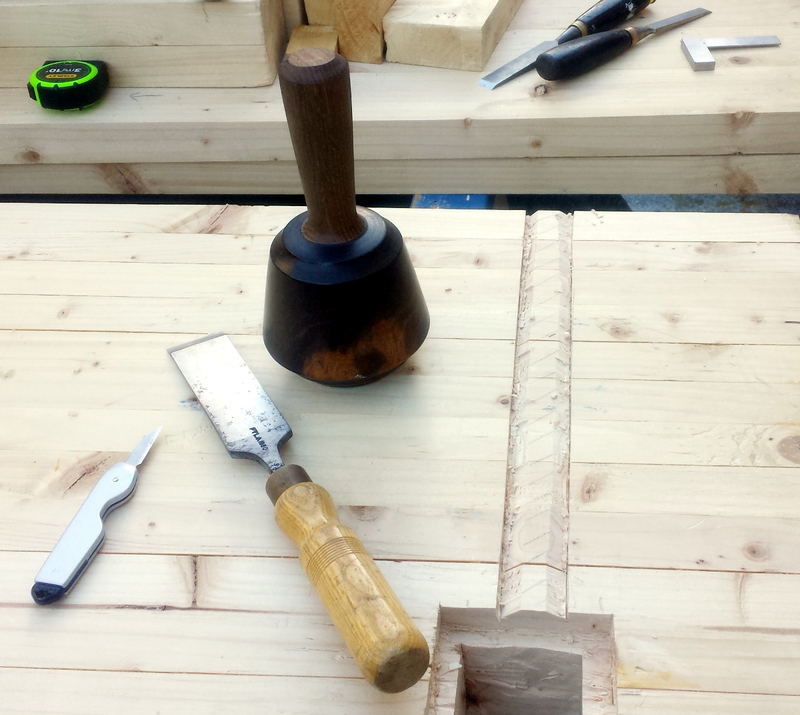 Started by tidying up the mortice and tenon on the leg joint a bit more. And there’s a shedload to clean up. Those are the after photos. 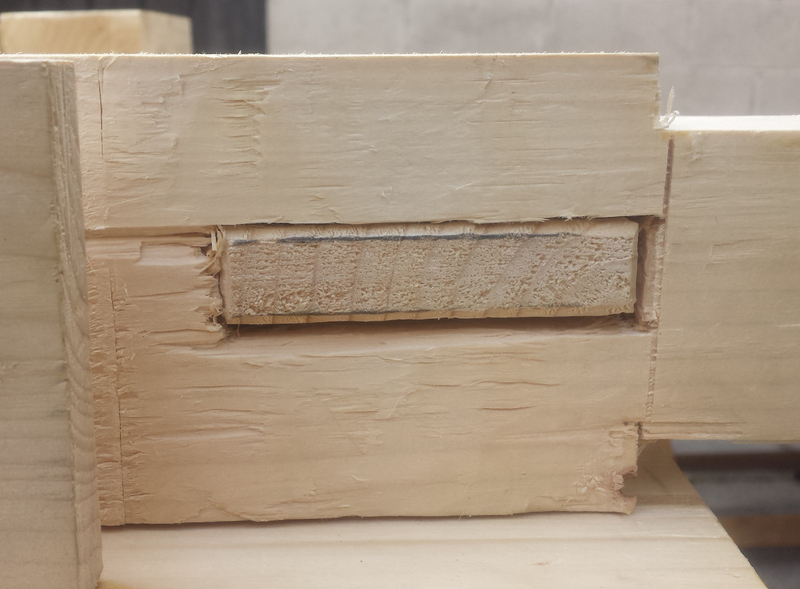 I’m starting to believe that no matter how sharp your chisel (this was just after taking the 1.5″ off the 1200 grit diamond plate and stropping it), you just can’t chop through pine from the side of the grain like that without it being incredibly messy. At least this bit gets hidden away behind the apron. Honestly, that’s embarrassing. 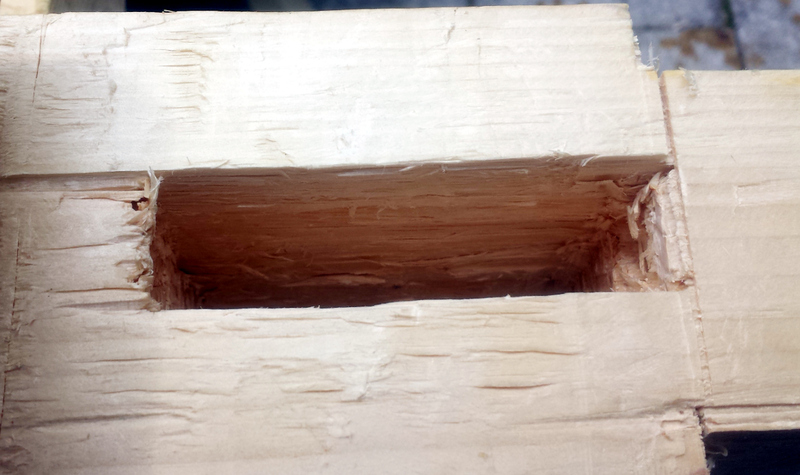 On the upside, it at least is a snug fit over most of the tenon and it’s hidden, but still. Yeesh. 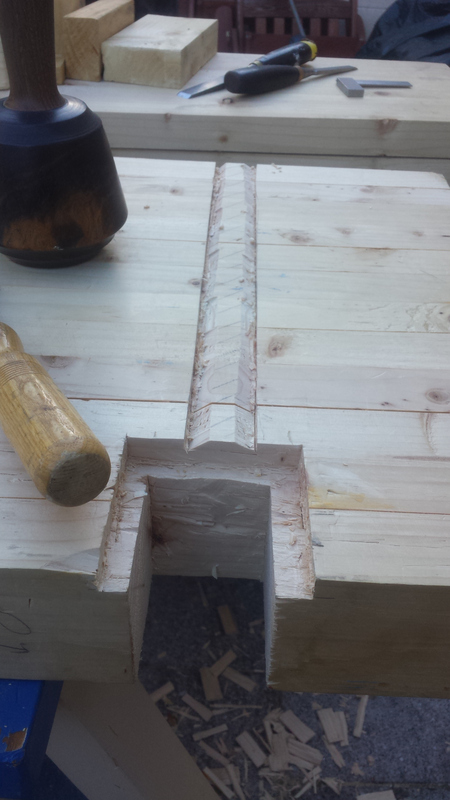 Anyway, I then planed the bottom stretcher out of twist, and marked out and cut the tenon on one end (I marked for both ends but I’ve left the other ends untouched on both stretchers for the moment), and drilled out the mortice through the bottom of the vice leg. 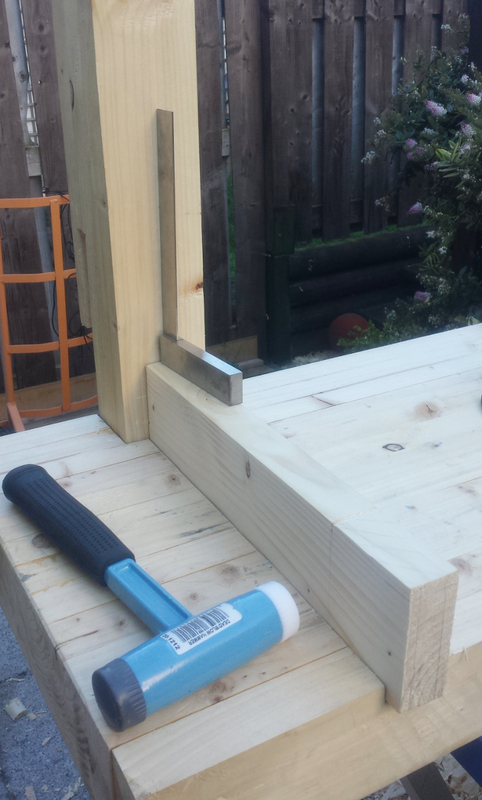 Today, I learned that drilling through six inches of even crappy pine is hard work with a bit and brace (though I don’t have an electric drill that could have even managed it and there’s no way I could have chopped that with a chisel neatly), and I then learned that if you drill through six inches of crappy pine with a bit and brace, the bit gets hot. 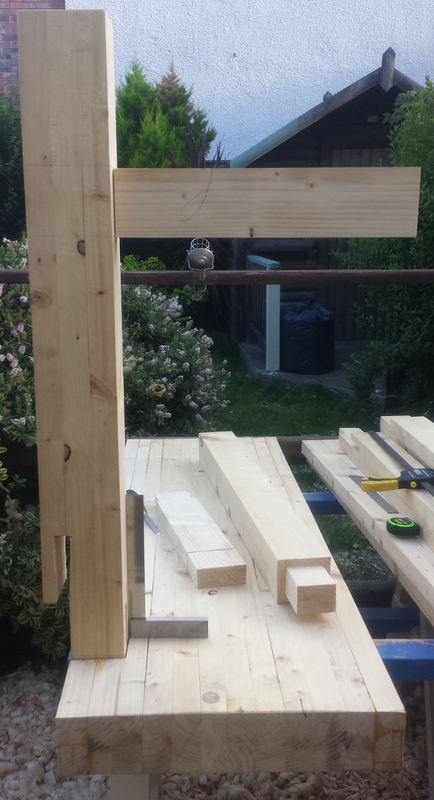 A bit of swearing later, I finished the drilling and chopped the mortice to something that could be called rectangular if you were blind and had had all your fingers removed and were in a generous mood, and at least the joint fits and works, but damn if it isn’t ugly. 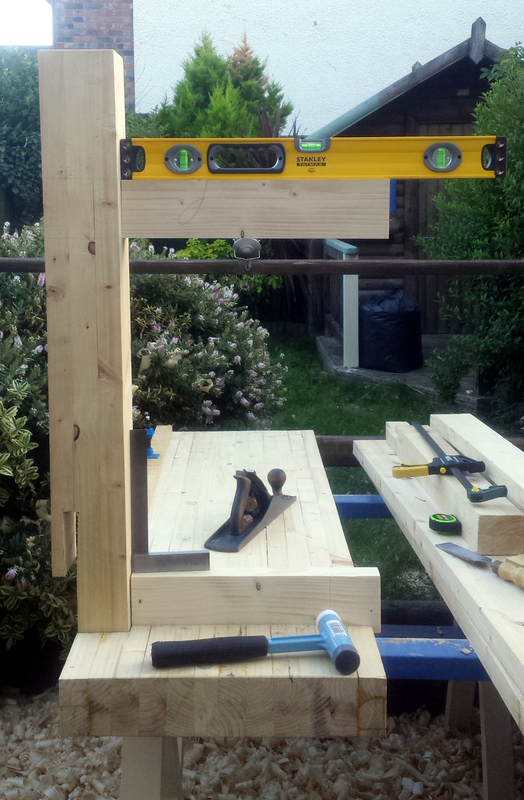 Maybe I need to wedge the tenon just for aesthetics to close up that unsightly gap at the top and bottom. 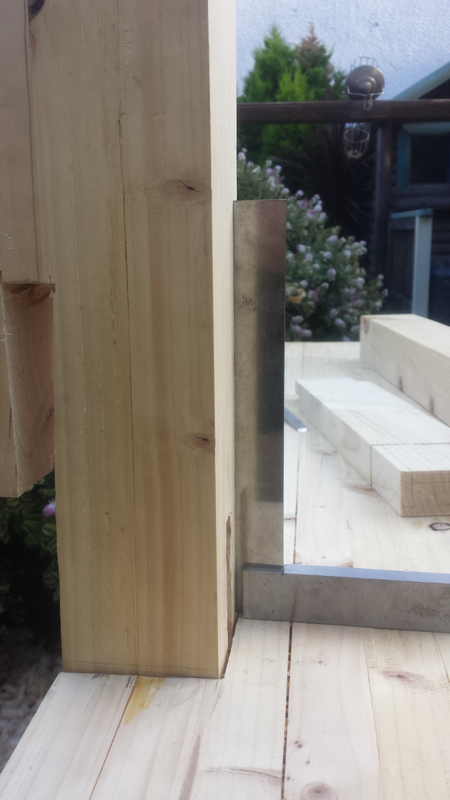 Then I finally stopped fapping about and marked out for the leg mortice in the benchtop, got out the japanese saw and cut the sides and then chopped out the waste with the chisel, in as small a bite size as I could manage. And it’s better than the first two mortices at least. And it needs a shoulder to take the shoulder at the top of the leg. Next was to cut the dado for the shoulder, and I don’t really have any tool that’s quite up to the task (the edge is too far away and too irregular to use as a reference for the fence of a #50 or #778 or any other plane I have, though I’ll be using those to clean up the dado later), so it’s knife-line and chisel time. And after chopping out the bulk of the central waste there with the chisel, I got out the #71 and cleaned it a little bit (it’s still scraggly, but cleaning jobs are weekday evening fodder because you can grab one plane from the box, go out the back, lift off the tarp and spend twenty minutes doing something simple before dinner, instead of needing half the toolbox for laying out and doing something larger). 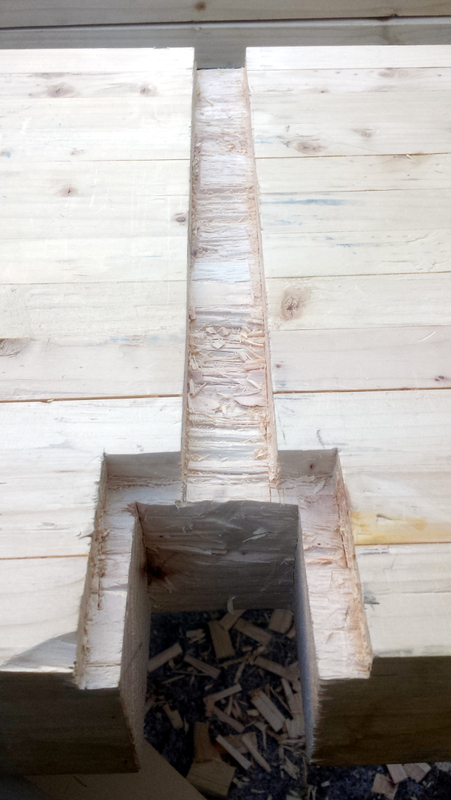 It was too tight a fit for the stretcher, even after cleaning some obvious irregular bits in the wall, so I planed down the stretcher a few shavings and that gave a nice snug fit. At this point the not-quite-our-pet cat decided it was looking too much like a small gallows and legged it. 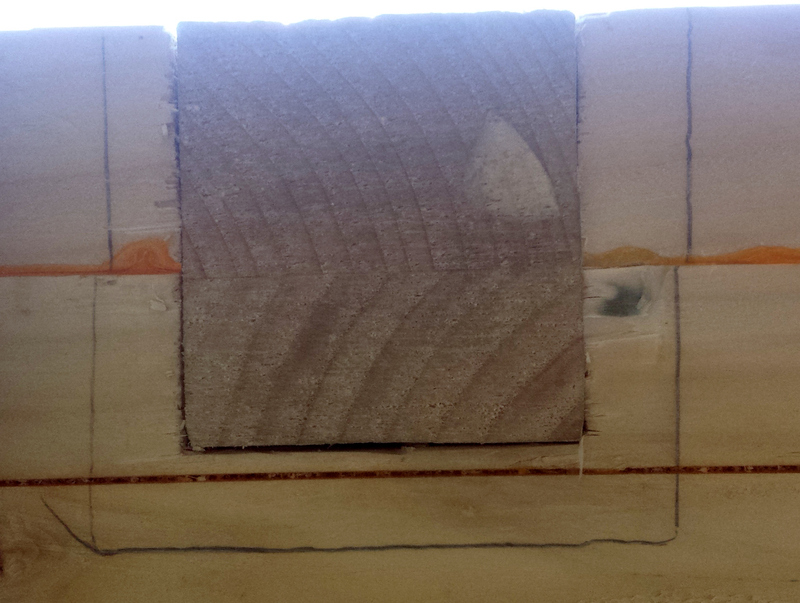 Gaps abound, but when drawbored, some of that should go away, and it’s still all loose and the end of that mortice is missing because the apron’s not in place. And besides, there’s waaay uglier things to point at elsewhere. I can live with this. This bit, though, I’m not so sure. 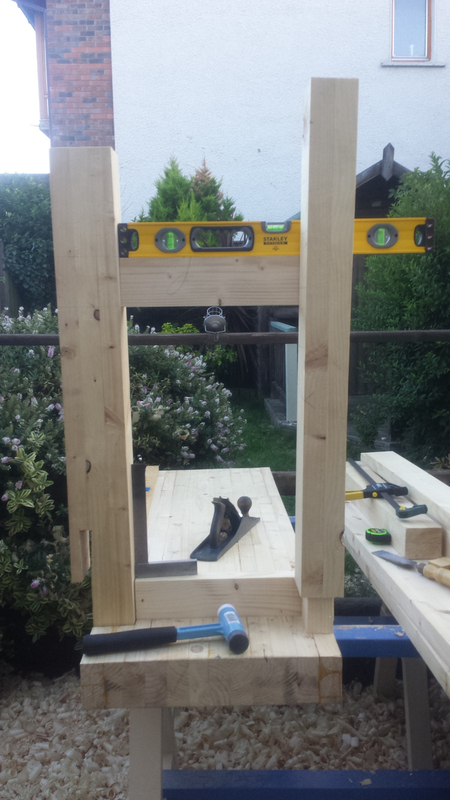 Can this be wedged and drawbored for both strength and not having cack-handedness-induced gaps?